This is a fascinating work on several fronts. 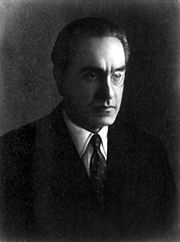 Julius Evola has become the patron saint of the Arian Nations neo Nazi movement in the U.S. He was spiritual advisor to Mossalini and to some extent to Hitler. He was certainly conservative, right wing, elitist. If this work is any example of the rest of his writings however, he has been greatly misunderstood. He has been accused of being Antisemetic. What he was was strongly of the opinion that the doctrines of the Jewish Faith were largely responsible for what he saw as the near total corruption of the Western world. He clearly understands the difference between a doctrine and a person holding a docrine. What he appears to have yearned for is a return to a noble spirit in man. I don't know. As I said I have not read any other of his books, but in this one he comes up clean. Another fascinating aspect of this work is the fact that it was translated by H.E. Musson, whom we later come to know as Bhikkhu Nanavira. This work was the first of Evola's books to be translated into English and appears to have been of major influence on Musson - he entered the Order almost immediately after doing this translation. As to the book itself, it is based on the Italian translation of the Sutta-pitaka of K.E. Newmann and G. de Lorenzo: I discorsi di Buddho which Musson rates highly. He also cites other Italian, English and Chinese translations as sources. The Buddhism understood by Evola is not at any point that I can discern in error. In fact Evola's understanding is at a very high level. Consequently I find the fact that Evola apparently did not pursue the teachings of the Buddha further a warning that mere knowledge is no guarantee of safety.